So should i use full screen or field? Hi! Your display's not a plasma or CRT, so you would use full field test patterns. Some TV do mess around with the black level based on content which can throw a wrench into the whole calibration process since you really don't know what the TV is doing or is going to do. You may want to try calibrating with those extra features turned on or off and see what kind of results you get. 1) When I initialize my i1 Display Pro, there are only two modes in the drop-down menu (standard and front projector); however, in the tutorial it states that "NOTE: If you have a standard Display 3 meter (retail or OEM), then four operating modes will appear (Standard, Plasma, CRT, and Front Projection Lens)". Why might this be? The license lists the colorimeter as a Display 3 Pro, although I'm not sure why given that it is not one of the custom calibrated meter that s sold here. Could this be the problem? 2) When I initialize the meter and display a 100% white pattern, I get some strange values and variance, sometimes on the same display. For example, my Vizio LCD HDTV reported 60hz the first time I initialized the meter on it but has reported 120hz on all subsequent initializations. An example of what seems like a strange Hz rate would be my newer Vizio LED HDTV, which reported 480hz. Are these values normal? Is it detecting the screen refresh rate? If so, these readings must be inaccurate. 3) I am tempted to purchase your i1 Display Pro (retail) upgrade to a calibrated "Display 3 Pro", but I have reservations... At 175$ it costs almost as much as the meter. What sort of improvements might I hope to see. I will be calibrating TVs that range from CRT to LCD to Plasma to LED, and that stretch the gambit with regard to age and manufacturer. Additionally, what is the turnaround time on the calibration once I've sent the meter in? 4) On the white balance section of the tutorial, it states that it is best not to adjust the green value, but to reduce DeltaE using the red and blue controls. Why exactly is it ill-advised to adjust green? I find that without doing so I struggle to achieve balance. 5) In the color calibration section for TVs without a CMS, it states "Adjust the display's main color control on the display until you have minimized the red error for red, green, and blue.". What does this mean exactly? Do you mean to reduce red error for three different patterns? Or do you mean simply to reduce the red error for the sRGB color space? I hope this question makes sense. 6) On two of my displays I have access to a CMS. I have been able to use both to some effect, but I don't understand how the three HSL values interact. How can I increase the saturation of a color without increasing its luminance? I have no idea how to fine-tune hue. Do you have any tips on how to adjust the HSL values in a CMS? Is it best to start with one or another? 7) Lastly, when a display lacks gamma controls or options and I end up with a Gamma value which falls short of 2.22 (say 2.15 for instance), do you recommend reducing contrast or brightness in order to raise the gamma, or is this a matter of preference which is unique to each screen/person. Thanks so much for any help/advice you might provide, and thank you again for the great tutorial! Greetings, and thank you for this clear and thorough guide! 3) I am tempted to purchase your i1 Display Pro (retail) upgrade to a calibrated "Display 3 Pro", but I have reservations... At 175$ it costs almost as much as the meter. What sort of improvements might I hope to see. I will be calibrating TVs that range from CRT to LCD to Plasma to LED, and that stretch the gambit with regard to age and manufacturer. Additionally, what is the turnaround time on the calibration once I've sent the meter in? Tom can chime in on this too but I believe the actual lab time is fairly fast (a day or so). Most of the waiting is for transit there and back. Yes. You will have additional modes only if we calibrate the meter. It doesn't matter. The meter will always report some multiple of 60 for NTSC displays. Turnaround time is just a couple of days. The improvement can be significant with LED displays, less so with front projectors and LCDs. Plasmas are somewhere in between. Because green substantially affects gamma and overall light output. The software reports errors for red, green, and blue. Choose the Color setting that provides the lowest error in red. The interaction between saturation and luminance depends on how the CMS is designed. Regarding hue, select the setting that results in the lowest dE. No, in such a case there's really nothing you can do about this, unless you have 10-point RGB white balance controls. If you do, then you can use the green cointrol to adjust gamma, making sure to also use red and blue to maintain good white balance. 1) When calibrating colors, the tutorial says to display a color pattern (plume) at 100%. The issue that I'm having is that if I set my luminosity (Y) to 120cd/m, my dE is always way off due to the my color luminosity. I have read on other tutorials that color should be calibrated using 75% signal test patterns, but when I think about it I'll have failed to calibrate my colors according to the white point... right? 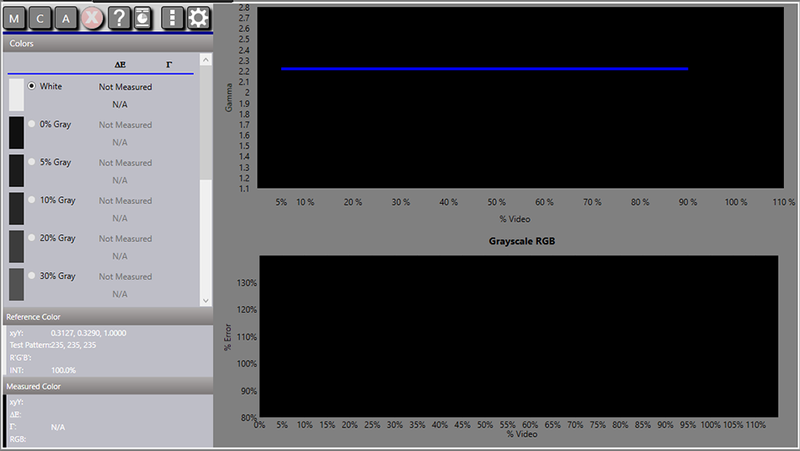 3) I've discovered inconsistencies between two other calibration programs and ChromaPure when taking readings. In addition to ChromaPure Standard Edition, I have Calman Control and Spyder HD. I wanted to see how SpyderHD's simple workflow does as a preliminary calibration, which I did using Calman Control's Andvanced Workflow. I fine-tuned the rudimentary calibrations done by SpyderHD, calibrating the white point and greyscale, setting the sharpness, and further calibrating colors using the display's CMS -- this is in addition to the main color and tint adjustments already done. I was able to get pretty good results... the readings I did just to compare with the Spyder4 values were either the same or within the margin of error. However, when I looked at the readings reported between Calman and ChromaPure, I was concerned to see very different numbers. For example, my dE error on the white point and along the grayscale rose substantially, my Gamma curve was no longer linear and dropped off at the 80-90% mark, and my reported color error went from less than 5 dE max to numbers as high as 35 (again with luminosity errors being most severe). Moreover, I have found strange variance between readings in different modules within ChromaPure! For example, if I open the color management module and calibrate successfully using a 100% red pattern, I get a different reading from the same source within the post-calibration color gamut module. A final worry is that when I display a 100% white internal pattern from a TV, it is read as having a much higher Y value and different RGB levels than the 100% White test patterns on the ChromaPure Calibration disc. Can anyone think of a reason that my software would be receiving different readings from multiple others (Spyder HD, Calman Control, and iProfiler) while using the same colorimeter (on two of them, since I used the Spyder4 on its software)? I checked the settings on both programs, and aside from a few options available in one and not another (measurement smoothing etc) they are the same. If you are using v3, you should always use a 100% white reference even if you selected 75% intensity on the main page and used 75% intensity color patterns. If you select 100% intensity, then use 100% white and 100% color. Try calibrating at 75% intensity instead of 100%. That is more likely to provide reasonable p-erformance throughout the color range. I cannot answer any of this without some actual data. Please send to ChromaPure Support instead of here. I need a calibration report. Thanks for the response. I'll go ahead and refer my question about readings to ChromaPure. Hi there. I'm a novice calibrator using Idisplay Pro and Chromapure. Your wlakthrough here is amazing. Thank you for putting this together. I had a question regarding section 1.3.6 however. FIrst we measure 100% white but then in this section you mention to use 75% slides for the rest of the colors in the Gamut module in Chromapure. Am I supposed to use 100% slides for the colors when you first go through them and then use 75% when it says (for instance) Red 75%, Blue 75%, etc or during the first run through where they are just labeled Red, Green, Blue, etc we are supposed to use 75%? If yes to using 75% through the first run through, what would you use when the selection in the software actually goes through the 75% area (followed by 50% and 25%)? Thank you for your help! Where can I find the updated walkthrough? The screenshots on the first post still look like they are missing some information in them so I'm assuming I'm using the wrong one. Thanks. Where can I find the updated walkthrough? In the first few posts of this thread. The screenshots on the first post still look like they are missing some information in them so I'm assuming I'm using the wrong one. I had a question regarding section 1.3.6 however. FIrst we measure 100% white but then in this section you mention to use 75% slides for the rest of the colors in the Gamut module in Chromapure. Am I supposed to use 100% slides for the colors when you first go through them and then use 75% when it says (for instance) Red 75%, Blue 75%, etc or during the first run through where they are just labeled Red, Green, Blue, etc we are supposed to use 75%? If yes to using 75% through the first run through, what would you use when the selection in the software actually goes through the 75% area (followed by 50% and 25%)? Thank you for your help! I'm not really sure I understand the question. If the guide says to use 100%, use 100%. If the guide says to use 75%, use 75%. 75% is generally recommended for colors and 100% for white. Please understand I am pretty much a novice but like to try to calibrate my TV when I get a new one to the best of my ability which is all self learned talking to folks like you and studying some on my own. My questions may be irrelevant and/or foolish and I apologize in advance for that. Just trying to learn. Here is what I found confusing. i'm not saying it's wrong as maybe I just do not understand. 1. Section 1.2.1 - I have a setting for SyncRa which I do not see in your walkthrough screenshot. I'm not sure if this is because we are using different meters or not but I do not see that mentioned. 2. Section 2.4.9 - You state "The errors (dE) are shown as CIE94 in the image above. If all are below 2.0 then you are done. If they are not, then make the necessary spot adjustments to reduce the errors as much as possible. " First I don't know what dE corresponds to in the screenshot above that statement and that is probably my fault but I don't see anything in that image that is "below 2.0" which you would be referring to. 3. Section 2.5 - My Gamma module looks nothing like this. I believe it's all the same information but it looks completely different. That's as far as I've gotten in my muiltiple testing/learning in the past week with a few TVs, devices, and sessions. Again, I apologize in advance and mean no disrespect to what you are doing. Just confused by some of it because of lack of knowledge. Thank you so much for this walkthrough regardless. Invaluable. I see. So when it says White, Red, Green, etc you use 75% even though it is not indicated. I guess it switches to the "Saturations" tab when it gets to the 75% so that's not part of the initial Gamut tab measurements. I guess I'll just stay away from that. Thank you for your reply. Comments are appreciated as they may the guide easier to understand. If you're confused odds are others are confused as well. I have a Display 3 PRO myself (not the standard meter) so I don't see this. I've sent a note off to Tom of ChromaPure to clarify and will update the guide. SyncRa is likely "Sync Rate". Not sure why it's cut off - do you maybe have your font set larger than normal? (Not that that should matter - software should accommodate). 60Hz is the refresh rate of most displays so it's likely fine. Not everyone knows this so I've gone through the guide and changed 'dE' to 'ΔE' to make the guide better match the software. ΔE is shown in the left side of the screen under the 3 measured values (x, y, Y). Scroll up in the list to see ΔE shown as the column heading. The actual ΔE heading title is not in the screenshot in 2.4.9 as we're seeing lower in the list. The ΔE is shown as N/A as measurements have not been taken yet. Good catch. These are the old screenshots. I've now fixed it. Great! Glad you are open to the comments! Ah. You could be right. My laptop has a high resolution screen so I had to bump up the scale a bit to make it manageable. That could very well be. Thank you for this! I gathered that was the case but I've thought I've understood other things in the past and have been wrong so thank you for this clarification. Great. Again it was easy to understand it was probably the same thing as it looks like all the same content but having it look exactly the same makes you feel better if you're a novice as I am when you are going through and trying to make sure you're in the right place. Much appreciated. You are most welcome. I figured as you mentioned that I'm not the only person out there that likes to dabble in this stuff that wants to make sure they are doing everything right. Thank you for putting the effort in for this walkthrough and the updates you mentioned! It's unfortunately extremely common for software developers to get this wrong / not test with accessibility in mind. It's in fact more the norm than the exception. Good luck and happy calibrating! I've now added some clarification on the Scan Rate option to explain. For most sources use 60 Hz in N. America (Sometimes 24 Hz, if that is what the user has set the display at. If the user doesn't know, then they should use 60 Hz). 50 Hz is for the European system.